The BHS line of Material Handling Cages was designed for construction sites and other applications that require lifting heavy loads to upper stories. They’re built for extreme durability and long service in harsh conditions, with all-steel construction and a powder coat that resists damage from impact, scratches, chemical exposure, and the elements. The MHC features versatile mobility options. Four-way fork pockets make for safe travel via forklift, while large-scale casters roll easily over floors. Choose between single-point and four-point lift attachments; either option allows users to lift fully loaded Cages with cranes or other lifting equipment. Expanded steel caging on all four sides of the unit keep contents safely contained. 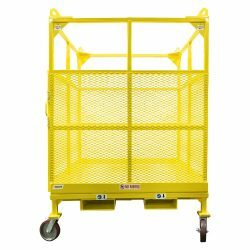 With a load capacity of 3,000 pounds, Material Handling Cages provide safe, efficient transportation for construction materials and other essentials of the building trades. To learn more about material handling solutions from BHS, call the sales team at 1.800.BHS.9500. Contact your nearest BHS dealer for ordering information or to discuss custom options.